Around thirty miles from Missoula in the Bitterroot Valley lies the Lee Metcalf National Wildlife Refuge. Like several of my favorite NWRs, this one was established as a haven for migratory birds, most notably waterfowl, during the bad old days when uncontrolled hunting and habitat loss had put the future of even species we now think of as common in doubt. As a result, early migration season is an excellent time to visit. The park even features a Welcome Back Waterfowl day when the community is encouraged to come out and learn about the ducks, geese, and swans that visit the valley – an event that usually occurs in early April but this year took place on March 24. In company with a fine group of folks from the Five Valleys Audubon Society, I made the trip to Lee Metcalf that day. Even the ride over was productive, with Eurasian Collared-Dove, plenty of Black-billed Magpie, Hooded Merganser, and my first-of-the-year Wood Ducks spotted along the road. Long before the mist burned off the landscape, long before the coffee hit my system, I could already tell that this day was going to do wonderful things for my year list. My specific goal was to see Trumpeter Swans, which, let’s just say it’s lucky that they’re not my new nemesis species – we spotted a group of three from the parking lot as soon as we got out of our cars. I mostly just wanted to stare at them, but they shared a pond with numerous Pintails, Gadwalls, American Wigeons, more Hoodies, Common Goldeneye, and a handful of Lesser Scaup, as well as the obligatory Mallards. A second pond held not only more of the same, but some American Coots and Canada Geese. While we scoped the ponds and tried unsuccessfully to make one of the Goldeneye a Barrow’s, a ranger emerged from the visitor center. Bob, a friendly gentleman who was preparing for a day of waterfowl-centric children’s activities, nevertheless took the time to not only invite us in to partake of the complimentary cocoa and cookies, but also tipped us off to a stray California Quail (another introduced gallinaceous species to check off my Montana list) and an early-arriving Say’s Phoebe, which we sadly missed. Maybe I’m weird, but there is nothing I like better in a visitor center (aside from clean and comfortable restrooms) than a good taxidermy collection, and Lee Metcalf features a strong entry in this category. Mounted swans and hawks swing from the ceiling, while ducks and smaller birds, as well as the skins and skulls used for the hands-on portions of the children’s programs, cover nearly all of the walls. As we headed back outside and picked out the quail and American Tree and Song Sparrows around the parking lot area, I discovered a new, mammalian focus of my interest — the Columbian ground squirrel, a charismatic little rodent with white eyeliner, a red nose, and a surprising degree of self-confidence for prey. I watched their antics for a while, as they dodged in and out of holes around the visitor center, until my attention was seized back by the arrival of a calling pair of Sandhill Cranes. The day was heating up literally as well as figuratively, and we struck out along one of the hiking paths. Many more of the same waterfowl we’d already seen turned up on additional ponds, but we also spotted nesting Bald Eagles and Great Blue Herons, and a small flock of Snow Geese. 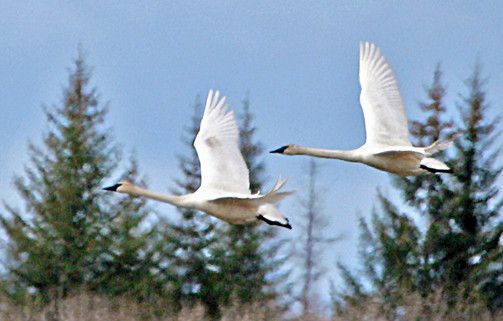 An additional fly-over by more Trumpeter Swans got the group charged up. And we noticed several Red-tailed Hawks, just teasers for what was to come. By the time lunch was over, it was apparent that the weather was going to be fine, not only for us, but for the migrating raptors who were kettling in numbers. Beyond the Red-tails, we spotted late Rough-legged Hawks, Turkey Vultures, an American Kestrel and a couple of other falcons too high to id properly (both Peregrine and Prairie are possible here), and, confirming that once you see a nemesis you see it everywhere, two Golden Eagles. At last we plunged into the woods, hoping for Great Horned Owls. That was not to be, alas, but we did manage a grand slam of Montana nuthatch species (White-breasted, Red-breasted, and Pygmy) with their usual attendants the Black-Capped Chickadees, and we spotted another merganser species (Common Merganser) winging rapidly upriver. The last great find of the day came in the form of a sure harbringer of spring proper – a Western Bluebird flycatching from a snag. All told, the trip took my year list from 40 to 64, with Trumpeter Swan also going on my life list. Terry McEneaney did a spectactular job as guide, and meeting the local Audubon Society crew for the first time was a lot of fun. I’m ready to declare it now – spring is here. Welcome back waterfowl, indeed. Nice post and it makes me wish I was in the west. All I’ve seen lately are early Palm and Pine Warblers. Yes, Corey: I had the same thought. Where’s her year list ?! Glad you saw Golden Eagles again, they are just such magnificent creatures. And wouldn’t that have been a lovely place to find a vagrant male Smew? The best of luck next time!! There’s Oil in Them Thar Birds!